There's a state route running through Tucson that's been nicknamed, "The Road to Nowhere." Now, ADOT is working to fix that and link roadway to I-10. 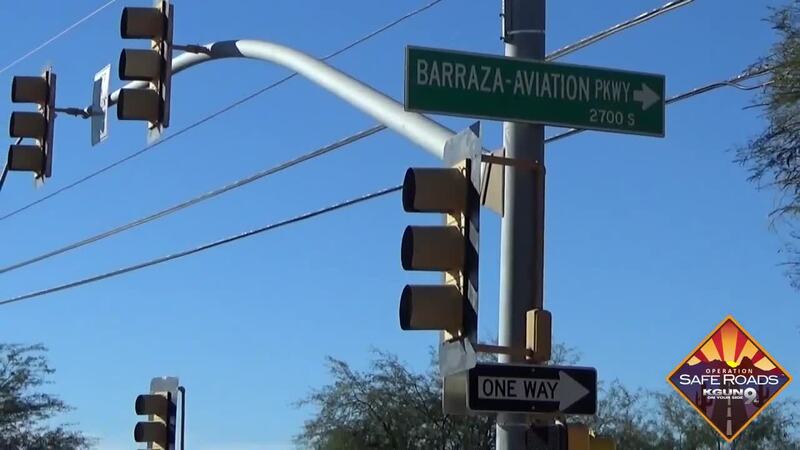 TUCSON, Ariz. - ADOT's "Road to Nowhere" is technically named B-210, the Barrazza-Aviation Parkway. It runs through the central part of Tucson and ends at Golf Links. It got the nickname from events that happened over 45 years ago, when residents and businesses along the Aviation corridor raised complaints to ADOT. At the time, they complained about the plan being destructive by taking lots of proposed alignment of the road. ADOT then stopped its planning process and did very little else. Katie Dusenberry was a Pima County Supervisor and at the center of the controversy in the mid-1970's. She said hundreds of protesters of the parkway showed up at Supervisors' meetings wanting the parkway scrapped. Similar events occurred at Tucson City Council meetings. One meeting was filled with almost a thousand protesters who didn't want the parkway to move forward. So, ADOT sensed there was not political will to finish the design and stopped work on the plan. However, ADOT has recently submitted a plan to finally connect Aviation with I-10 that will run along Alvernon. ADOT also proposed eliminating the Palo Verde connections and adding a new interchange to I-10 at Country Club. Both plans were submitted for public review. The western side of Aviation is far more controversial and has been redesigned several times over the life of the project. It's now called Downtown Links and will connect Aviation through downtown and under the 6th St. railroad crossing. Jayme Sumner is one of the residents who lives north of Aviation, and attended ADOT's open house. He wants the agency to move forward with its plan, saying the nearly 50 years it taken to finish and connect Aviation to I-10 is long enough. He says he's ready to use it for it's original intention: a quick ride off I-10 through downtown, near the UA and out to DM Air Force Base, ultimately connecting to I-10. There's no money for the Aviation connection yet, so even if the stakeholders, travelers and residents agree, the actual work to connect "the road to nowhere" is still several years away.